The American Kennel Club, or AKC, has increased its membership. New to the AKC pack are an energetic dog whose main interests is ducks and a friendly dog that would rather chase rabbits. 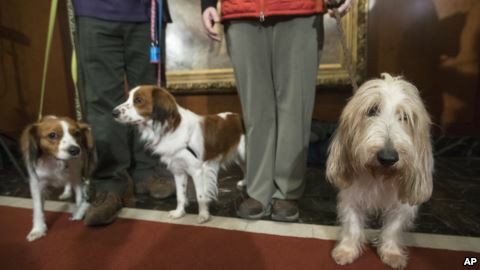 The American Kennel Club announced Wednesday that it is recognizing the Nederlandse kooikerhondje and the grand basset griffon Vendeen. They are the first breeds added to the roster in two years. The newly added breeds are permitted to compete in many dog shows this year. But they are not yet able to take part in the biggest show; they will have to wait until 2019 to enter the Westminster Kennel Club show, held in New York City. 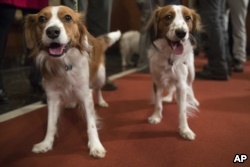 The Nederlandse kooikerhondje have been around for hundreds of years in Holland. They are called Kooikers for short. The pretty brown-and-white dogs can be seen in some Dutch Old Master paintings. D. Ann Knoop-Siderius breeds kooikers. Kooikers were trained to help hunters move ducks into water traps called koois. The practice fell from popularity in the 1800s and the dogs almost disappeared. There are now about 7,000 left worldwide. The first recorded American litter was born in 1999. It is still a rare breed in the country, with about 500 in the U.S.
Kooikers will compete in the sporting dog group. The grand basset griffon Vendeen goes by “GBGV'' for short. The basset breed has deep roots in Europe. A smaller cousin, the petit basset griffon Vendeen, and the long-eared basset hound have been recognized by the AKC for many years. GBGVs have long, rough fur. They are native to France. They weigh around 18 to 20 kilograms and stand fairly low to the ground. They are members of the hound group. GBGVs are known for their speed, lasting energy and good-natured personalities. “They're happy to get up and do things if you ask them to, but they're not particularly busy, in terms of pacing back and forth or throwing a ball in your lap,'' she said. Juno has competed in agility, obedience and other events. Experts say GBGVs enjoy children and family life but are not easy to train. The breed might not be the best choice for a first-time dog owner. The AKC is the nation's oldest purebred dog registry. It recognizes 192 breeds, from silky Afghan hounds to the xoloitzcuintlis, also called the Mexican hairless dog. The AKC does not consider recognition of a breed unless there are at least 300 of the dogs spread across at least 20 states. Some animal-rights supporters say working to increase interest in purebreds is wrong. They say it leads to cruel breeding operations. Activists also argue that too many dogs are in public shelters already and need owners. The AKC says responsible breeding permits people to choose pets with somewhat predictable characteristics. The club also notes that mixed-breed dogs compete in many events it supports, such as agility and obedience competitions. The Associated Press reported this story. 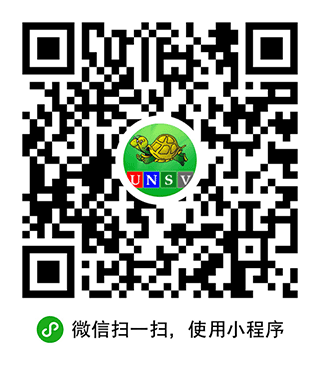 Caty Weaver adapted it for Learning English. Ashley Thompson was the editor. naughty - adj. ​behaving badly — used especially to describe a child who does not behave properly or obey a parent, teacher, etc.